Weiss is a variable and multi-applicable concept in voice, text, image and performance. Weiss can be called an instant composition alternating between different media, making use of video footage between documentary and abstraction, but also playing with the different aspects of voice and the physical presence of the performer. This project can be placed in the broader context of a trilogy, namely: Weiss – Red – Glaer where multiple aspects of voice and body will be researched. For instance in Glaer the capacity of voice to manifest by means of vibration through glass objects, thus creating a new physical presence in the space. As spectator we are constantly scanning for meaning. Weiss makes use of various images and the wide spectrum of the human voice to present the spectator with a range of interpretative possibilities. In this way Weiss invites the spectator to create his or her own essence of white. The project Weiss was inspired by the book Weiss by the Japanese author Kenya Hara. Each performance is different, and adds to the next one. 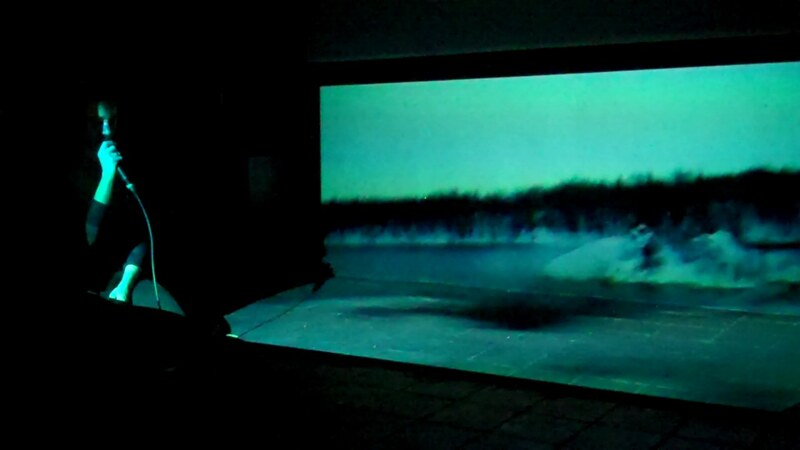 New video or sound footage is added, the piece is adapted to the new location it finds itself in.